← Next Ladder Meeting: Fitness and Health! Next Ladder Meeting: Lungs and Hearts – Strong and Sick! October’s meeting of the Ladder will focus on the lungs and heart. As the medical scholar you are, you probably already know some things about your heart: like how it pumps blood throughout your body. You probably know some things about lungs too: like how they expand in your chest when you inhale to bring oxygen into your body, and contract when you exhale to release carbon dioxide that your body needs to get rid of. 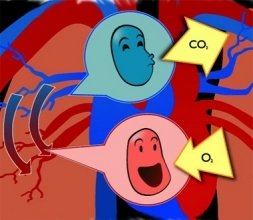 But did you know that your heart and lungs actually work as a team to do the job of getting oxygen in and carbon dioxide out of your bodies? And that if either your heart or lungs get sick or aren’t doing their jobs, your circulatory team runs into trouble, which means trouble for your whole body. At the next meeting of the Ladder we’ll learn about the heavy duty team work performed by your heart and lungs, what happens if they aren’t working together, and how medical professionals can identify and fix things that go wrong with them. So bring your heart, lungs and the rest of you, along with a friend, and join us for lunch (provided! ), learning, and fun at the next meeting of the Ladder – Saturday, October 12th at 12:30pm at the UROC building (2001 Plymouth Ave N, Minneapolis). The UROC building is reachable by Metro Transit bus routes 19, 32 & 7.